Around 9pm the NIFRS responded to a road traffic collision involving the vehicles. Firefighters used hydraulic cutting equipment to release a 48-year-old woman and a 53-year-old man from one car. Two men in their 20s were out of the other car on arrival of FRS. All four casualties were taken to hospital by ambulance. Fire crews from Central, Springfield and Westland stations attended the incident. Earlier that day there was a single car crash on the Old Ballynahinch Road. NIFRS responded to a report of a car overturned on its roof in Bailies Mills, Lisburn. Firefighters used hydraulic cutting gear to release a 23-year-old woman from the car. A 20-year-old woman was self-rescued from the vehicle. Both casualties were conveyed to hospital by ambulance. 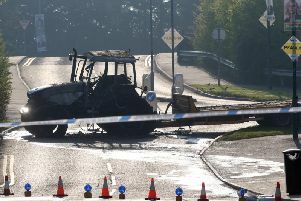 Fire crews from Lisburn and Central stations attended the incident.